When I was a little girl, a single steamed flounder, a plate of vegetables and plenty of rice would feed our family. My parents would allocate me and my sister a flounder roe each. Since flounder come with two roes by default, it was lucky they stopped at two kids. The roe was a treat! The roe itself isn’t a thing of beauty, but I loved biting into it and imagining I was eating thousands of tiny fish at once. If you’re wondering what flounder roe tastes like, I find it mild and slightly creamy with a only hint of fishiness. The fish eggs are tiny – much smaller than other fish roe. Salmon is my number one fish, but if I must pick a white fish, it’s got to be flounder. I adore flounder but I usually steam or baked it. Flounder has a sweet flavour and a delicate texture. When cooked, it flakes with a little pressure and the large bones make it easy to eat whole. As a kid, my parents never shied away from serve whole fish to us. We were always instructed to eat carefully so we learned to pick bones clean. Whole flounder is cheap here in New Zealand though I’ve been told that in certain areas of Auckland, you could spear them or put out a net and get plenty enough for all your family and friends. These days, the easiest way to get whole flounder is just to buy it from any fish shop. They’re cheap too! This flounder dish is inspired NZ’s Chef of the Year David Schofield, who made this last month at the Out Standing In Their Fields demonstration at Grey Lynn Farmers’ Markets. The way he dealt to the fins with scissors and peeled the skin off in one piece really made an impression on me. David also makes no secret of his love for butter. Neither do I. 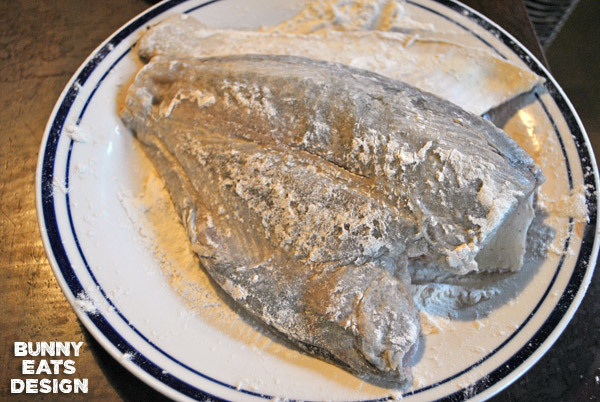 Flounder can be quite delicate especially after the skin is removed so the flour and butter acts as a delicious shield and protects the meat. This recipe is super yum and makes me want to invest in a flounder net. Using sharp kitchen scissors, cut all the fins off the edges of the flounder. Be generous rather than erring on the side of caution. Slice them off! On the dark skinned side of the flounder, make a small cut through the skin with a sharp knife at the base of the tail. Prepare a little flap of skin that you can pull. Sprinkle salt generously on the cut. The salt will give you a good grip on the slippery skin and carefully peel the skin away from the fish. The skin should come off in 1 complete piece. Some flesh might start to come up with the skin, If the flesh starts to pull up, stop and use a sharp knife to guide the offending flesh back down. Cut the head and tail off the flounder. Remove the liver* if you wish. Sprinkle salt and pepper onto the floured plate to make a basic seasoned flour. Lay the flounder on the plate of flour and dust liberally on both sides. This will turn golden and crunchy later. Melt a knob of butter in a large frying pan. Add the flour coated flounder. I found I could comfortably fit 2 fish in my pan. Fry the flounder for about 5 minutes each side on medium heat until golden. Add more butter if you love butter. * Flounder roe tastes creamy and rich when cooked. It might be high in cholesterol, but you’re not eating a plate of the stuff! If you like this recipe or have any tips or questions, please leave a comment. It would make my day. Ciao Bunny, I loved your comment, I am totally with you! What are you up to today? I will be in Ponsonby at the Dorothy Butlers Children Book store with Arantxa to make sugar roses, pop by if you are free! Sorry, I was on Waiheke all today. Hope you had a lovely day at Dorothy’s. Oh My! This looks amazing … and not too fattening. I can’t wait to try it out. Found this on Pinterest & I can’t wait to try it. It looks so simple, easy & delicious! Thanks for dropping by Linda. Stoked to be found on Pinterest too. 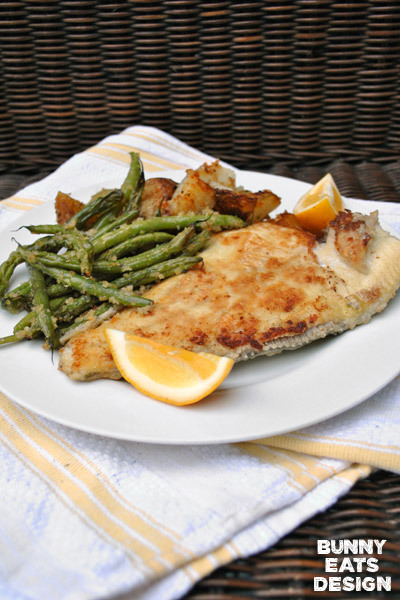 I love flounder and this looks like a great recipe to add to my arsenal!! We have fish a few times a week for the health benefits and flounder is one I just recently began and everyone liked it so I look forward to trying out your recipe. Thanks for sharing! This is amazing. Definitely making this. Thanks for the instructions on how to prepare it too, its kind of an intimidating fish to deal with. Oh it’s so worth it Kara. I adore flounder though so I may be a bit biased. Are flounder cheap to buy where you are? They are very cheap here. Sometimes as cheap as $2US for a fish. Wow, fantastic blog layout! How long have you been blogging for? you made blogging look easy. The overall look of your site is excellent, let alone the content!. 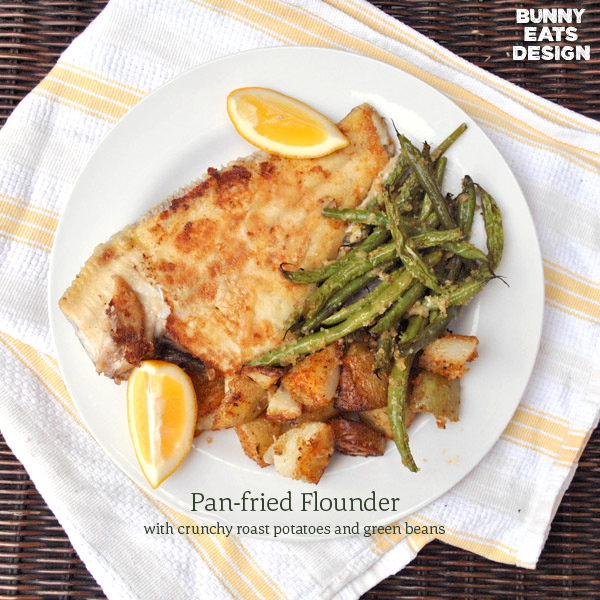 Thanks For Your article about Buttery Golden Pan-Fried Flounder | Bunny. Eats. Design. A fantastic article. I loved reading this article. If you like, check out my own website. You’re welcome. Hope your dinner was yummy. Thanks for dropping by. Hey, looks fantastic! How do you get your potatoes so crunchy? Is there a particular oil/technique you favour? Mmm…now you have me feeling nostalgic for the roe. Bloody good recipe mate. From a Kiwi in Western Australia where Flounder are NOT plentiful. Oh yum! Perfect on a cold night when you’re too busy to spend the afternoon cooking. I can see this in my future. That looks good. Flounder isn’t something we see much around here–maybe I’m not looking in the right place–but I might try the technic with another kind of fish. Cooked in butter, it can’t go wrong! Can you get sole? That’s a good substitute for flounder. You’re right about butter and fish though. Actually, butter makes most things lovely. Yum! I definitely will be trying this this weekend! This is absolutly the best tasting. I love to add a little Tony’s along with the salt and pepper to my flour and it will taste devine.